UK Poker News is always striving to bring you the best news, views and interviews from the world of UK and Irish poker. 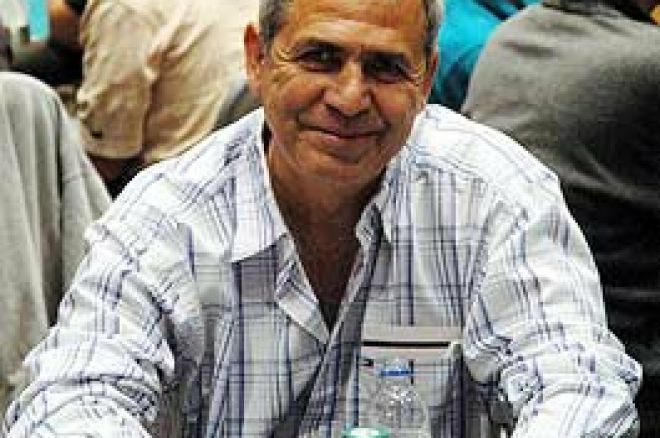 One of the “best” in poker is surely Mel “Silver Fox” Judah, a poker legend with a tournament cash roll call that stretches from floor to ceiling, including two Bracelets and more than forty cash finishes from the WSOP alone, including a famous WSOP final table appearance with Stu Ungar. UK Poker News caught up with Mel at the filming of the Ladbrokes Poker Ladies European Open and talked about these and much more. In Part 1, Mel looks back on his glittering poker career, his plans for this year at the WSOP and his future in other areas of poker. In Part 2, later on in UK Poker News, Mel discusses with admiration the poker skills of Stu Ungar, one of the greatest ever players, whom he played alongside at the WSOP. UKPN: Mel, thank you for sparing some time to chat with us. UKPN: Firstly, Mel, what brings you to this event? MJ: Well, I was interested in what was going on here when I had heard it was a ladies event. I was interested in how they were running this event for television because, if I get involved in this area of work in the future, I need to know how everything is set up. Playing tournaments continuously on the circuit involves a great deal of travelling around the world which becomes extremely tiring. Eventually you have to slow down and look at different avenues. UKPN: What manner of work is it you are looking to start up? MJ: I am currently involved in tournament directing and commentating for television. Also, I am about to open my own poker school (Academy of Poker) for beginners which will be launched later this year. UKPN: Mel, you are one of the leading players in the poker world and have been for several years. Can you give us a summary of your early years? MJ: Well, I’ve been playing poker tournaments seriously since 1981 and I started going to the World Series from 1985. I used to play in London before I moved to Australia and I saw a lot of opportunities in poker tournaments in those days. The numbers weren’t as big as they are today – you had fields of maximum 200-300, sometimes even less, about 150 – and everybody knew each other. It was rare to find a new face. It was a lot easier then, but also a lot tougher because everyone knew how you played. There was a lot of variety and a lot of different types of games in those days. No Limit Hold’em has always been around but no one saw it escalating to where it is today. It has literally taken over all other types of poker and I think we need to try and preserve and save some of the other games because eventually they will die out in all the casinos and there will just be No Limit Hold’em. Although that is very profitable for a lot of casinos and online sites, I think the poker rooms will eventually suffer because people will only play No Limit Hold’em and be unable to play any other type of game. I think we need to educate people to play some of the other games and still keep No Limit Hold’em at the top. UKPN: At the World Series of Poker this year, they are introducing a big buy-in H.O.R.S.E. tournament. Do you think that will go some way toward straightening this problem out? MJ: Yes, that was my next thought! I think that is the way forward for poker. The $50,000 buy-in (mixed games) will eventually be at the same level as the World Series main event. It will take 5-7 years before it replaces the main event because it will show that it is the most skilful form of poker, with the final table being No Limit Hold’em. UKPN: For the benefit of newer players to poker, can you tell us about some of your major wins that you have had in recent years? MJ: In the World Series, I have been placed in the money over 40 times. My best results have been in Seven Card Stud events. I’ve played nearly all over the world and I’ve actually won tournaments in nearly every country. I’ve also won tournaments in every type of game apart from Deuce-Seven which I didn’t play because it was a rebuy tournament and I don’t like rebuy tournaments at the World Series. In every type of game I have won a tournament so that is very satisfying. Now only the big one is left! In Seven Card Stud, I have won two WSOP Bracelets. I won the WPT event at the Bicycle Club (Los Angeles 2003) and lots of seconds and thirds at the World Series. UKPN: What are your plans at this year’s WSOP in terms of tournaments you might play? MJ: I have not looked at the schedule yet, but I would say, quite a lot of them, mostly the televised events. UKPN: When you spend so many weeks at an event such as the WSOP, what do you do to relax or wind down during the festival? Do you try to get away from poker or do you, like some, head straight for the side action? MJ: I like to relax and pace myself because you need to be sharp, fit and at your best at all times. UKPN: Where did you pick up poker in the first place and learn to develop such a good game, or did it come naturally? MJ: I used to watch my father play and learned the basic foundations about how I should approach the style of poker that he was playing which was draw poker. We used to play for fun at home with friends and family and I used to win most of the money most of the time! When my wife went for a holiday with our son for a couple of months to Australia, I decided to go to the casino. The Victoria Sporting Club had poker games and since then I have never looked back. I found it was easy to win money and was invited into private games, so I thought I might as well take a look at Las Vegas after that.